U.S. Senator from Massachusetts Early political involvement Elizabeth Ann Warren (née Herring; born June 22, 1949) is an American politician and academic serving as the senior United States Senator from Massachusetts since 2013. Warren was formerly a prominent scholar specializing in bankruptcy law. A noted progressive leader, Warren has focused on consumer protection, economic opportunity, and the social safety net while in the Senate. Some commentators describe her position as left-wing populism. For other people named Elizabeth Warren, see Elizabeth Warren (disambiguation). Elizabeth Ann Warren (née Herring; born June 22, 1949) is an American politician and academic serving as the senior United States Senator from Massachusetts since 2013. Warren was formerly a prominent scholar specializing in bankruptcy law. A noted progressive leader, Warren has focused on consumer protection, economic opportunity, and the social safety net while in the Senate. Some commentators describe her position as left-wing populism. Warren is a graduate of the University of Houston and Rutgers Law School. She taught law at several universities, including the University of Houston, the University of Texas at Austin, the University of Pennsylvania, and Harvard University. Warren's initial foray into public policy began in 1995 when she worked to oppose what eventually became a 2005 act restricting bankruptcy access for individuals. Her profile rose due to her forceful stances in favor of more stringent banking regulations following the 2007–2008 financial crisis. She served as chair of the Congressional Oversight Panel of the Troubled Asset Relief Program and was instrumental in the creation of the Consumer Financial Protection Bureau, for which she served as the first Special Advisor. 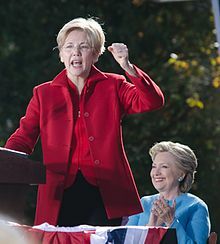 On February 9, 2019, at a rally in Lawrence, Massachusetts, Warren announced her candidacy for the 2020 United States presidential election. Warren was born Elizabeth Ann Herring in Oklahoma City on June 22, 1949, the fourth child of middle-class parents Pauline (née Reed, 1912–1995) and Donald Jones Herring (1911–1997). Warren has described her family as teetering "on the ragged edge of the middle class" and "kind of hanging on at the edges by our fingernails". She had three older brothers and was raised as a Methodist. Warren lived in Norman until she was 11 years old, when the family moved to Oklahoma City. When she was 12, her father, a salesman at Montgomery Ward, had a heart attack, which led to many medical bills as well as a pay cut because he could not do his previous work. He later worked as a custodian for an apartment building. Eventually, their car was repossessed because they failed to make loan payments. To help the family finances, her mother found work in the catalog order department at Sears. When she was 13, Warren started waiting tables at her aunt's restaurant. Warren became a star member of the debate team at Northwest Classen High School and won the state high school debating championship. She also won a debate scholarship to George Washington University (GWU) at the age of 16. She initially aspired to be a teacher, but left GWU after two years in 1968 to marry Jim Warren, whom she met in high school. Warren and her husband moved to Houston, where he was employed by IBM. She enrolled in the University of Houston and graduated in 1970 with a Bachelor of Science degree in speech pathology and audiology. The Warrens moved to New Jersey when Jim received a job transfer. She soon became pregnant and decided to remain at home to care for their child. After their daughter turned two, Warren enrolled in Rutgers Law School at Rutgers University–Newark. Shortly before graduating in 1976, Warren became pregnant with their second child. She received her J.D. and passed the bar examination. The couple had two children, Amelia and Alexander, before they divorced in 1978. Two years later, Warren married Bruce H. Mann, a law professor, but she decided to retain the surname of her first husband. She also has grandchildren. According to public financial disclosure forms filed with federal election officials in February 2019, Warren and her husband have a combined net worth between $4 million and $11 million. Warren has said that as a child she was told by older family members that she had Native American ancestry, and that "being Native American has been part of my story, I guess, since the day I was born". Warren was criticized in 2012 for having listed herself as a minority in a directory for Harvard Law School. Opponents said Warren falsified her heritage to advance her career through minority quotas. Warren denied these allegations, and several colleagues and employers (including Harvard) have said her reported ethnic status played no role in her hiring. An investigation by The Boston Globe in 2018 found "clear evidence, in documents and interviews, that her claim to Native American ethnicity was never considered by the Harvard Law faculty, which voted resoundingly to hire her, or by those who hired her to four prior positions at other law schools". PolitiFact noted: "Before this controversy arose in 2012, there is no account that Warren spoke publicly of having Native American roots, although she called herself Cherokee in a local Oklahoma cookbook in 1984." Following a challenge by President Donald Trump to pay $1 million to her favorite charity if she could prove her Native American ancestry via a DNA test, Warren released results of a DNA test in 2018. It concluded that "while the vast majority of [Warren's] ancestry is European, the results strongly support the existence of an unadmixed Native American ancestor in [her] pedigree, likely in the range of 6–10 generations ago." The use of DNA to determine Native American heritage was criticized by the Cherokee Nation as being "inappropriate and wrong". During a 2019 public appearance in Sioux City, Iowa, Warren was asked by an attendee, "Why did you undergo the DNA testing and give Donald more fodder to be a bully?" Warren responded, "I am not a person of color; I am not a citizen of a tribe. Tribal citizenship is very different from ancestry. Tribes, and only tribes, determine tribal citizenship, and I respect that difference." Warren later reached out to leadership of the Cherokee Nation to apologize to the tribe, and Cherokee Nation executive director of communications, Julie Hubbard, stated that Warren understands "that being a Cherokee Nation tribal citizen is rooted in centuries of culture and laws not through DNA tests." For a year, Warren taught children with disabilities who were enrolled in a public school. Her qualifications were based on an "emergency certificate", because she had not taken the education courses that were required for a regular teaching certificate. During law school, Warren worked as a summer associate at Cadwalader, Wickersham & Taft. After she received her J.D. and passed the bar examination, Warren decided to perform legal services from home; she wrote wills and did real estate closings. In the late 1970s, 1980s, and 1990s, Warren taught law at several universities throughout the country while researching issues related to bankruptcy and middle-class personal finance. She became involved with public work in bankruptcy regulation and consumer protection in the mid-1990s. Warren started her academic career as a lecturer at Rutgers University, Newark School of Law (1977–78). She moved to the University of Houston Law Center (1978–83), where she became Associate Dean for Academic Affairs in 1980, and obtained tenure in 1981. She taught at the University of Texas School of Law as visiting associate professor in 1981, and returned as a full professor two years later (staying 1983–87). In addition, she was a visiting professor at the University of Michigan (1985) and research associate at the Population Research Center of the University of Texas at Austin (1983–87). During this period, Warren taught Sunday school. Early in her career, Warren became a proponent of on-the-ground research based on studying how people actually respond to laws in the real world. Her work analyzing court records, and interviewing judges, lawyers, and debtors, established her as a rising star in the field of bankruptcy law. One of her key insights, according to Warren and economists who follow her work, was that rising bankruptcy rates were not caused by prolifigate consumer spending, but by the attempts of middle-class families to buy homes in good school districts. Warren joined the University of Pennsylvania Law School as a full professor in 1987 and obtained an endowed chair in 1990 (becoming William A Schnader Professor of Commercial Law). She taught for a year at Harvard Law School in 1992 as Robert Braucher Visiting Professor of Commercial Law. In 1995, Warren left Penn to become Leo Gottlieb Professor of Law at Harvard Law School. As of 2011[update], she was the only tenured law professor at Harvard who had attended law school at an American public university. Warren was a highly influential law professor. Although she published in many fields, her expertise was in bankruptcy and commercial law. In that field, only Bob Scott of Columbia and Alan Schwartz of Yale were cited more often than Warren. In 1995, Warren was asked to advise the National Bankruptcy Review Commission. She helped to draft the commission's report and worked for several years to oppose legislation intended to severely restrict the right of consumers to file for bankruptcy. Warren and others opposing the legislation were not successful; in 2005 Congress passed the Bankruptcy Abuse Prevention and Consumer Protection Act of 2005, which curtailed the ability of consumers to file for bankruptcy. 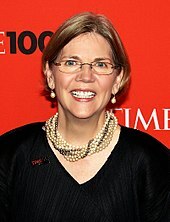 From November 2006 to November 2010, Warren was a member of the FDIC Advisory Committee on Economic Inclusion. She is a member of the National Bankruptcy Conference, an independent organization that advises the U.S. Congress on bankruptcy law. She is a former vice president of the American Law Institute and a member of the American Academy of Arts and Sciences. 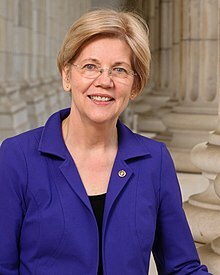 Warren's scholarship and public advocacy combined to act as the impetus for the establishment of the Consumer Financial Protection Bureau in 2011. 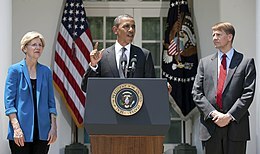 Warren stands next to President Barack Obama as he announces the nomination of Richard Cordray as the first director of the CFPB, July 2011. Warren was an early advocate for the creation of a new Consumer Financial Protection Bureau (CFPB). The bureau was established by the Dodd–Frank Wall Street Reform and Consumer Protection Act signed into law by President Obama in July 2010. In September 2010, President Obama named Warren Assistant to the President and Special Advisor to the Secretary of the Treasury on the Consumer Financial Protection Bureau to set up the new agency. While liberal groups and consumer advocacy groups pushed for Obama to formally nominate Warren as the agency's director, Warren was strongly opposed by financial institutions and by Republican members of Congress who believed Warren would be an overly zealous regulator. Reportedly convinced that Warren could not win Senate confirmation as the bureau's first director, Obama turned to former Ohio Attorney General Richard Cordray and in January 2012, over the objections of Republican senators, appointed Cordray to the post in a recess appointment. Warren was registered as a Republican from 1991 to 1996. Warren voted as a Republican for many years, saying, "I was a Republican because I thought that those were the people who best supported markets". According to Warren, she began to vote Democratic in 1995 because she no longer believed that to be true, but she states that she has voted for both parties because she believed that neither party should dominate. According to her, the Republican Party was no longer "principled in its conservative approach to economics and to markets" and was instead tilting the playing in favor of big financial institutions and against "middle class American families". There is nobody in this country who got rich on his own. Nobody. ... You moved your goods to market on the roads the rest of us paid for; you hired workers the rest of us paid to educate; you were safe in your factory because of police forces and fire forces that the rest of us paid for. You didn't have to worry that marauding bands would come and seize everything at your factory, and hire someone to protect against this, because of the work the rest of us did. Now look, you built a factory and it turned into something terrific, or a great idea. God bless. Keep a big hunk of it. But part of the underlying social contract is, you take a hunk of that and pay forward for the next kid who comes along. President Barack Obama later echoed her sentiments in a 2012 election campaign speech. Warren ran unopposed for the Democratic nomination and won it on June 2, 2012, at the state Democratic convention with a record 95.77% of the votes of delegates. She encountered significant opposition from business interests. In August the political director for the U.S. Chamber of Commerce claimed that "no other candidate in 2012 represents a greater threat to free enterprise than Professor Warren". She nonetheless raised $39 million for her campaign, the most of any Senate candidate in 2012, and showed, according to The New York Times, "that it was possible to run against the big banks without Wall Street money and still win". Warren received a prime-time speaking slot at the 2012 Democratic National Convention on September 5, 2012. She positioned herself as a champion of a beleaguered middle class that "has been chipped, squeezed, and hammered". According to Warren, "People feel like the system is rigged against them. And here's the painful part: They're right. The system is rigged." Warren said Wall Street CEOs "wrecked our economy and destroyed millions of jobs" and that they "still strut around congress, no shame, demanding favors, and acting like we should thank them". On November 6, 2012, Warren defeated incumbent Scott Brown with a total of 53.7% of the votes. She is the first woman ever elected to the U.S. Senate from Massachusetts, as part of a sitting U.S. Senate that had 20 female senators in office, the largest female U.S. Senate delegation in history, following the November 2012 elections. 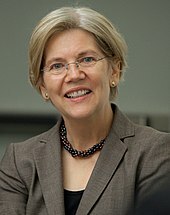 In December 2012, Warren was assigned a seat on the Senate Banking Committee, the committee that oversees the implementation of Dodd–Frank and other regulation of the banking industry. Warren was sworn in by Vice President Joe Biden on January 3, 2013. At Warren's first Banking Committee hearing in February 2013, she pressed several banking regulators to answer when they had last taken a Wall Street bank to trial and stated, "I'm really concerned that 'too big to fail' has become 'too big for trial'." Videos of Warren's questioning became popular on the Internet, amassing more than one million views in a matter of days. At a Banking Committee hearing in March, Warren asked Treasury Department officials why criminal charges were not brought against HSBC for its money laundering practices. With her questions being continually dodged, Warren compared money laundering to drug possession, saying: "If you're caught with an ounce of cocaine, the chances are good you're going to go to jail ... But evidently, if you launder nearly a billion dollars for drug cartels and violate our international sanctions, your company pays a fine and you go home and sleep in your own bed at night." In May 2013, Warren sent letters to the Justice Department, Securities and Exchange Commission, and the Federal Reserve, questioning their decisions that settling rather than going to court would be more fruitful. Also in May, suggesting that students should get "the same great deal that banks get", Warren introduced the Bank on Student Loans Fairness Act, which would allow students to take out government education loans at the same rate that banks pay to borrow from the federal government, 0.75%., Independent Senator Bernie Sanders endorsed her bill saying: "The only thing wrong with this bill is that [she] thought of it and I didn't". During the 2014 election cycle, Warren was a top Democratic fundraiser. Following the election, Warren was appointed to become the first-ever Strategic Adviser of the Democratic Policy and Communications Committee, a position that was created just for her. The appointment further added to speculation about a possible presidential run by Warren in 2016. Saying "despite the progress we've made since 2008, the biggest banks continue to threaten our economy", in July 2015 Senator Warren, along with John McCain (R-AZ), Maria Cantwell (D-WA), and Angus King (I-ME) re-introduced the 21st Century Glass-Steagall Act, a modern version of the Banking Act of 1933. The legislation is intended to reduce the risk for the American taxpayer in the financial system and decrease the likelihood of future financial crises. In a September 20, 2016, hearing, Warren called for the CEO of Wells Fargo, John Stumpf, to resign, adding that he should be "criminally investigated" over Wells Fargo's opening of two million checking and credit-card accounts without the consent of their customers under his tenure. In December 2016, Warren gained a seat on the Senate Armed Services Committee, termed by The Boston Globe to be "a high-profile perch on one of the chamber's most powerful committees", which the Globe said would "fuel speculation about a possible 2020 bid for president". During the debate on the nomination of Senator Jeff Sessions for United States Attorney General in February 2017, Warren quoted a letter Coretta Scott King had written to Senator Strom Thurmond in 1986 when Sessions had been nominated for a federal judgeship. King wrote, "Mr. Sessions has used the awesome power of his office to chill the free exercise of the vote by black citizens in the district he now seeks to serve as a federal judge. This simply cannot be allowed to happen." Republicans in the Senate voted that by reading the letter from King, Warren had violated Senate rule 19, which prohibits impugning the character of another senator. This action prohibited Warren from further participating in the debate on Sessions' nomination for, and Warren instead read King's letter while streaming live on the Internet. As part of the rebuke of Warren, Senate Majority Leader Mitch McConnell said of Warren from the Senate floor, "She was warned. She was given an explanation. Nevertheless, she persisted." McConnell's language became a slogan for Warren and others. On October 3, 2017, Warren called for Wells Fargo's chief executive, Tim Sloan, to resign during his appearance before the Senate Banking Committee, saying, "At best you were incompetent, at worst you were complicit." Warren marches in the 2018 Boston Pride Parade. According to the UK magazine New Statesman, she is among the "top 20 US progressives". Warren has expressed concerns over perceived conflicts of interest of President Trump. The Presidential Conflicts of Interest Act, written by Warren, was first read in the Senate in January 2017. In November 2018, Warren said she will not vote for Trump's United States-Mexico-Canada Agreement (USMCA) saying, "It won't stop outsourcing, it won't raise wages, and it won't create jobs. It's NAFTA 2.0." She also believes that it will make it harder to reduce drug prices because it will allow drug companies to lock in the prices they are currently charging for many drugs. Warren has been highly critical of President Trump's immigration policies. In 2018, she had called for the abolition of U.S. Immigration and Customs Enforcement (ICE). Warren has criticized U.S. involvement in the Saudi Arabian–led intervention in Yemen. In January 2019, Warren criticized President Donald Trump's announcement of his decision to withdraw U.S. troops from Syria and Afghanistan. Although she agreed that US troops should be withdrawn from Syria and Afghanistan, she said such withdrawals should be part of a "coordinated" plan formed with US allies. On January 6, 2017, in an email to supporters, Warren announced that she would be running for a second term as a U.S. Senator from Massachusetts. She wrote in the e-mail, "The people of Massachusetts didn't send me to Washington to roll over and play dead while Donald Trump and his team of billionaires, bigots, and Wall Street bankers crush the working people of our Commonwealth and this country. ... This is no time to quit." The Senate election in Massachusetts took place on November 6, 2018. Warren defeated her Republican opponent, Geoff Diehl by a 60% to 36% margin. In the runup to the 2016 U.S. presidential election, Warren was put forward by supporters as a possible presidential candidate. However, Warren repeatedly stated that she was not running for president in 2016. In October 2013, she joined the other fifteen Senate Democratic women in signing a letter that encouraged Hillary Clinton to run. There was much speculation about Warren being added to the Democratic ticket as a vice-presidential candidate. On June 9, 2016, after the California Democratic primary, Warren formally endorsed Hillary Clinton for president. In response to questions when she endorsed Clinton, Warren said that she believed herself to be ready to be vice president, but she was not being vetted. On July 7, CNN reported that Warren was on a five-person short list to be Clinton's vice-presidential running mate. However, Clinton eventually chose Tim Kaine. Warren vigorously campaigned for Hillary Clinton and took an active role in the 2016 presidential election. She remarked that Donald Trump, the Republican presumptive nominee, was dishonest, uncaring, and "a loser". At a town hall meeting in Holyoke, Massachusetts on September 29, 2018, Warren said she would "take a hard look" at running for president in the 2020 election after the conclusion of the 2018 United States elections. On December 31, 2018, Warren announced that she was forming an exploratory committee to run for president. 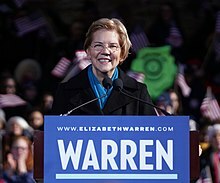 On February 8, 2019, Warren officially announced her candidacy at a rally in Lawrence, Massachusetts, at the site of the 1912 Bread and Roses Strike. Warren staged her first campaign event in Lawrence, a former industrial mill town famous for that strike, to demonstrate the constituency groups she hopes to appeal to, including working class families, union members, women, and new immigrants. Warren is calling for major governmental changes. It won't be enough to just undo the terrible acts of this administration. We can't afford to just tinker around the edges – a tax credit here, a regulation there. Our fight is for big, structural change. This is the fight of our lives. The fight to build an America where dreams are possible, an America that works for everyone. A longtime critic of President Trump, at her opening rally Warren called Trump a "symptom of a larger problem [that has resulted in] a rigged system that props up the rich and powerful and kicks dirt on everyone else". In the 2016 United States presidential election, faithless electors from Washington and Hawaii each cast a vote for her for Vice President of the United States. On February 19, 2010, Warren appeared on Bill Maher's Real Time with Bill Maher show and participated in a "bit". Maher says, "Before the crash, I had most of my savings in Lehman Brothers." He waits a beat, then says, "I don't have a question, I just want you to hold me." He collapsed into her lap and she obliged. She has appeared in the documentary films Maxed Out and Michael Moore's Capitalism: A Love Story. Warren appeared in season two, episode 6 "Women in Politics", of the documentary Makers: Women Who Make America (2014). In 2017, Kate McKinnon played Warren on Saturday Night Live. Warren's popularity is the basis of a wide array of merchandise sold in her name, much of which incorporates Mitch McConnell's "Nevertheless, she persisted" remark, including an action figure of the senator. Musician Jonathan Mann has written songs about Warren, including, for example, "She Persisted". In 2009, The Boston Globe named her the Bostonian of the Year and the Women's Bar Association of Massachusetts honored her with the Lelia J. Robinson Award. She was named one of Time magazine's 100 Most Influential People in the World in 2009, 2010 and 2015. The National Law Journal repeatedly has named Warren as one of the Fifty Most Influential Women Attorneys in America, and in 2010 it honored her as one of the 40 most influential attorneys of the decade. In 2011, Warren was inducted into the Oklahoma Hall of Fame. In January 2012, Warren was named one of the "top 20 US progressives" by the British New Statesman magazine. In 2009, Warren became the first professor in Harvard's history to win the law school's The Sacks–Freund Teaching Award for a second time. In 2011, she delivered the commencement address at the Rutgers Law School in Newark, her alma mater, and obtained an honorary Doctor of Laws degree and membership in the Order of the Coif. In 2018, the Women's History Month theme in the United States was "Nevertheless, She Persisted: Honoring Women Who Fight All Forms of Discrimination against Women", referring to Mitch McConnell's "Nevertheless, she persisted" remark about Warren. Warren and her daughter Amelia Tyagi wrote The Two-Income Trap: Why Middle-Class Mothers and Fathers Are Going Broke. Warren and Tyagi point out that a fully employed worker today earns less inflation-adjusted income than a fully employed worker did 30 years ago. Although families spend less today on clothing, appliances, and other consumption, the costs of core expenses such as mortgages, health care, transportation, and child care have increased dramatically. The result is that even with two income earners, families are no longer able to save and have incurred greater and greater debt. The authors find that it is not the free-spending young or the incapacitated elderly who are declaring bankruptcy so much as families with children ... their main thesis is undeniable. Typical families often cannot afford the high-quality education, health care, and neighborhoods required to be middle class today. More clearly than anyone else, I think, Ms. Warren and Ms. Tyagi have shown how little attention the nation and our government have paid to the way Americans really live. In 2005, Warren and David Himmelstein published a study on bankruptcy and medical bills, which found that half of all families filing for bankruptcy did so in the aftermath of a serious medical problem. They say that three-quarters of such families had medical insurance. This study was widely cited in policy debates, although some have challenged the study's methods and offered alternative interpretations of the data, suggesting that only seventeen percent of bankruptcies are directly attributable to medical expenses. Warren's book A Fighting Chance was published by Metropolitan Books in April 2014. According to a review published in The Boston Globe, "the book's title refers to a time she says is now gone, when even families of modest means who worked hard and played by the rules had at a fair shot at the American dream." Warren was paid $525,000 for the rights to the book by Henry Holt and Company. In April 2017, Warren published her eleventh book titled This Fight Is Our Fight: The Battle to Save America's Middle Class, in which she explores the plight of the American middle class and argues that the federal government needs to do more to help out working families with stronger social programs and increased investment in education. Warren received a $300,000 advance payment from the publisher for the book. Warren, Elizabeth (1987). "Bankruptcy Policy". The University of Chicago Law Review. 54 (3): 775–814. JSTOR 1599826. Warren, Elizabeth (1992). "The Untenable Case for Repeal of Chapter 11". The Yale Law Journal. 102 (2): 437–479. JSTOR 796843. Warren, Elizabeth (1993). "Bankruptcy Policymaking in an Imperfect World". Michigan Law Review. 92 (2): 336–387. JSTOR 1289668. Warren, Elizabeth (1997). "Principled Approach to Consumer Bankruptcy". American Bankruptcy Law Journal. 71: 483. Warren, Elizabeth (Fall 1998). "The Bankruptcy Crisis" (PDF). Indiana Law Journal. 73 (4): 1079. Warren, Elizabeth; Westbrook, Jay Lawrence (January 2000). "Financial Characteristics of Businesses in Bankruptcy". SSRN Electronic Journal. 73: 499. doi:10.2139/ssrn.194750. SSRN 194750. Himmelstein, David U.; Warren, Elizabeth; Thorne, Deborah; Woolhandler, Steffie (2005). "Illness and injury as contributors to bankruptcy". Health Affairs (Project Hope). Suppl Web Exclusives: W5–63–W5–73. doi:10.1377/hlthaff.w5.63. PMID 15689369. "The Vanishing Middle Class". In Edwards, John; Crane, Marion; Kalleberg, Arne L., eds. (2007). Ending Poverty in America: How to Restore the American Dream. The New Press. ISBN 978-1-59558-176-1. Himmelstein, David U.; Warren, Elizabeth; Thorne, Deborah; Woolhandler, Steffie J. (2005). "Illness and Injury as Contributors to Bankruptcy". SSRN Electronic Journal. doi:10.2139/ssrn.664565. Himmelstein, David U.; Thorne, Deborah; Warren, Elizabeth; Woolhandler, Steffie (2009). "Medical bankruptcy in the United States, 2007: Results of a national study". The American Journal of Medicine. 122 (8): 741–6. doi:10.1016/j.amjmed.2009.04.012. PMID 19501347. Chapter 11: Reorganizing American Businesses (Essentials). Aspen Publishers. 2008. ISBN 978-0-7355-7654-4. A Fighting Chance. Metropolitan Books. 2014. ISBN 978-1627790529. This Fight Is Our Fight: The Battle to Save America's Middle Class. Metropolitan Books. 2017. ISBN 978-1250120618. ↑ All reports and videos are available online at cop.senate.gov. 1 2 Ebbert, Stephanie; Levenson, Michael (August 19, 2012). "For Professor Warren, a steep climb". The Boston Globe. Retrieved January 27, 2014. ↑ "Warren brings her populist message to campaign". EconomicTimes. February 9, 2019. Retrieved February 9, 2019. ↑ "Efficiency of Elizabeth Warren's Populist Campaign". NewYorker. February 9, 2019. Retrieved February 9, 2019. 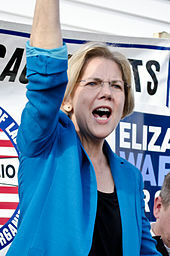 ↑ "Warren makes presidential bid official with call for change". NatPost. February 9, 2019. Retrieved February 9, 2019. 1 2 Lee, MJ; Krieg, Gregory (February 9, 2019). "Elizabeth Warren kicks off presidential campaign with challenge to super-wealthy – and other Democrats". CNN. Retrieved February 9, 2019. 1 2 Bierman, Noah; Phillips, Frank (November 7, 2012). "Elizabeth Warren defeats Scott Brown". The Boston Globe. Archived from the original on November 10, 2012. ↑ Dennis, Brady (August 13, 2010). "Elizabeth Warren, likely to head new consumer agency, provokes strong feelings". The Washington Post. Retrieved November 18, 2010. 1 2 3 4 5 6 7 8 Packer, George (2013). The Unwinding, an inner history of the New America. New York: Farrar, Straus, and Giroux. pp. 345–346. ISBN 978-0-374-10241-8. ↑ "Elizabeth Warren Fast Facts". CNN. December 31, 2018. Retrieved January 7, 2019. ↑ "10 Things You Didn't Know About Elizabeth Warren". U.S. News & World Report. October 4, 2010. Retrieved July 26, 2011. 1 2 3 Bierman, Noah (February 12, 2012). "A girl who soared, but longed to belong". The Boston Globe. Retrieved November 10, 2017. ↑ McGrane, Victoria (September 2, 2017). "Religion is constant part of Elizabeth Warren's life". The Boston Globe. Retrieved September 16, 2017. ↑ Durlach, Darren, photo of Warren with her three older brothers in "Warren's extended family split about heritage" by Sally Jacobs, The Boston Globe, September 16, 2017. Retrieved December 9, 2017. 1 2 3 Pierce, Charles P. (December 20, 2009). "The Watchdog: Elizabeth Warren". The Boston Globe (Sunday Magazine). Retrieved March 9, 2015. 1 2 Andrews, Suzanna (November 2011). "The Woman Who Knew Too Much". Vanity Fair. ↑ "Elizabeth Warren". The Huffington Post. 1 2 3 "Warren Winning Means No Sale If You Can't Explain It". Bloomberg. November 19, 2009. Archived from the original on October 17, 2015. ↑ Ebbert, Stephanie (October 24, 2012). "Family long a bedrock for Warren". The Boston Globe. Retrieved September 14, 2017. ↑ "Elizabeth Warren, Leo Gottlieb Professor of Law (faculty CV)" (PDF). Harvard Law School. March 9, 2015. Retrieved December 29, 2018. 1 2 3 4 5 Kreisler, Harry (March 8, 2007). "Conversation with Elizabeth Warren". Conversations with History. Institute of International Studies, University of California, Berkeley. 1 2 Kim, Mallie Jane (October 4, 2010). "10 Things You Didn't Know About Elizabeth Warren". U.S. News and World Report. ↑ Lee, MJ (April 16, 2014). "Elizabeth Warren: 'I was hurt, and I was angry'". Politico. Retrieved August 21, 2015. ↑ "Elizabeth Warren's family". The Boston Globe. Retrieved June 11, 2016. 1 2 Herndon, Astead W. (February 5, 2019). "Elizabeth Warren Disclosure Forms Show $300,000 Book Advance, Other Assets". The New York Times. ↑ Luhby, Tami (January 8, 2015). "Elizabeth Warren is worth millions". CNNMoney. 1 2 "Elizabeth Warren: DNA test finds 'strong evidence' of Native American blood". BBC News. October 15, 2018. ↑ Linskey, Annie (September 1, 2018). "Ethnicity not a factor in Elizabeth Warren's rise in law". The Boston Globe. Retrieved September 2, 2018. ↑ Greenberg, Jon (December 1, 2017). "he facts behind Elizabeth Warren, her claimed Native American ties and Trump's 'Pocahontas' insult". PolitiFact. Retrieved February 4, 2019. Before this controversy arose in 2012, there is no account that Warren spoke publicly of having Native American roots, although she called herself Cherokee in a local Oklahoma cookbook in 1984. There is no dispute that Warren formally notified officials at the University of Pennsylvania and then Harvard claiming Native American heritage after she was hired. ↑ "Trump promised $1 million to charity if Warren proved her Native American DNA. Now he's waffling". The Washington Post. ↑ Herndon, Astead W. (December 6, 2018). "Elizabeth Warren Stands by DNA Test. But Around Her, Worries Abound". The New York Times. Retrieved December 6, 2018. evidence that Ms. Warren has Native American pedigree '6–10 generations ago'. ↑ "US senator Elizabeth Warren faces backlash after indigenous DNA claim". BBC News. October 16, 2018. ↑ Weigel, David (January 5, 2019). "In Iowa, Sen. Elizabeth Warren tells a voter why she took that DNA test". The Washington Post. Retrieved January 7, 2019. ↑ Grim, Ryan. Elizabeth Warren Will Make Her Presidential Bid Official in February, The Intercept, January 31, 2019. ↑ Linskey, Annie (February 5, 2019). "Elizabeth Warren apologizes for calling herself Native American". Washington Post. Retrieved February 9, 2019. ↑ "Elizabeth Warren apologizes for identifying as Native American on Texas bar registration card". Salon. February 6, 2019. Retrieved February 9, 2019. ↑ Tarlo, Shira (December 7, 2018). "Elizabeth Warren receives standing ovation at surprise visit to Native American conference: report". Salon. Retrieved February 23, 2019. Democratic presidential candidate Sen. Elizabeth Warren (D-Mass.) received a standing ovation when she made a surprise appearance Tuesday at a Native American conference…Warren apologized to the Cherokee Nation earlier this month for releasing a DNA test in an attempt to prove it. It was most recently revealed that Warren listed her race as "American Indian" when she filled out form for the Texas state bar in 1986. ↑ Lee, MJ (February 12, 2019). "Elizabeth Warren makes unannounced appearance at Native American luncheon in Washington". CNN. Retrieved February 23, 2019. the Washington Post reported that Warren had listed her race as "American Indian" on a State Bar of Texas registration card in 1986. It marked the first time the claim had been documented in Warren's own handwriting, reignited a debate that had begun quiet down, and prompted yet another apology. "As Senator Warren has said she is not a citizen of any tribe and only tribes determine tribal citizenship," Kristen Orthman, Warren's spokeswoman, said in a statement. "She is sorry that she was not more mindful of this earlier in her career." ↑ "Elizabeth Warren biography". The Biography Channel. Retrieved September 19, 2012. ↑ "Educators endorse Elizabeth Warren for the U.S. Senate". massteacher.org. Retrieved September 19, 2012. ↑ TCTA. "Educator Certification Overview". Texas Classroom Teachers Association. Retrieved September 27, 2014. 1 2 Warren, Elizabeth (2008). "Curriculum Vitae" (PDF). Harvard Law School. ↑ Dionne Jr., Eugene Joseph. "Elizabeth Warren on health care and religion". The Washington Post. ↑ McGrane, Victoria (September 2, 2017). "Religion is constant part of Elizabeth Warren's life". The Boston Globe. Retrieved January 8, 2019. 1 2 Neyfakh, Leon (October 22, 2011). "Elizabeth Warren's unorthodox career". The Boston Globe. Retrieved February 22, 2015. ↑ Krugman, Paul (January 7, 2019). "Elizabeth Warren and Her Party of Ideas: She's what a serious policy intellectual looks like in 2019". The New York Times. Retrieved January 7, 2019. ↑ Leiter, Brian R. "Top 25 Law Faculties In Scholarly Impact, 2005–2009". Retrieved December 29, 2018. ↑ "National Bankruptcy Review Commission Fact Sheet". National Bankruptcy Review Commission (official website). August 12, 1997. Retrieved January 1, 2019. ↑ Andrews, Suzanna (November 2011). "The Woman Who Knew Too Much". Vanity Fair. Retrieved February 13, 2012. ↑ Sahadi, Jeanne (October 17, 2005). "The new bankruptcy law and you". CNNMoney. Retrieved April 12, 2007. ↑ "Advisory Committee on Economic Inclusion (ComE-IN)". FDIC. . Resignation announced in "Meeting Minutes: November 16, 2010" (PDF). FDIC Advisory Committee on Economic Inclusion. ↑ "Committees". National Bankruptcy Conference. Archived from the original on May 2, 2012. "Mission". National Bankruptcy Conference. Archived from the original on December 9, 2011. ↑ "President Obama Names Elizabeth Warren Assistant to the President and Special Advisor to the Secretary of the Treasury on the Consumer Financial Protection Bureau". September 17, 2010. Retrieved October 12, 2014. ↑ Nair, Pooja (2014). "Insights from Professor Warren: Analyzing Elizabeth Warren's Academic Career". Bloomberg Law. Archived from the original on February 24, 2015. Retrieved February 24, 2015. ↑ Host: Terry Gross (December 11, 2008). "What Does $700 Billion Buy Taxpayers?". Fresh Air from WHYY. National Public Radio. Retrieved December 12, 2008. ↑ Kantor, Jodi (March 25, 2010). "Behind Consumer Agency Idea, a Tireless Advocate". The New York Times. ↑ "President Obama Names Elizabeth Warren Assistant to the President and Special Advisor to the Secretary of the Treasury on the Consumer Financial Protection Bureau". The White House official website. September 17, 2010. Retrieved December 17, 2014. ↑ Andrew, Suzanna (November 2011). "The Woman Who Knew Too Much". Vanity Fair. Retrieved September 22, 2012. ↑ Wyatt, Edward (July 4, 2011). "An Agency Builder, but Not Yet Its Leader". The New York Times. Retrieved September 22, 2012. ↑ Rosenthal, Andres (December 8, 2011). "Lousy Filibusters: Richard Cordray Edition". The New York Times. 1 2 Seelye, Katharine Q. (November 10, 2012). "A New Senator, Known Nationally and Sometimes Feared". The New York Times. ↑ Cooper, Helene (January 4, 2012). "Defying Republicans, Obama to Name Cordray as Consumer Agency Chief". The New York Times. Retrieved June 9, 2012. ↑ Goodnough, Abby. "Times Topics: Bureau of Consumer Financial Protection". The New York Times. ↑ Jacobs, Samuel P. (October 24, 2011). "Elizabeth Warren: 'I Created Occupy Wall Street'". The Daily Beast. Retrieved September 29, 2018. ↑ "Why Elizabeth Warren Left The GOP". Retrieved January 1, 2019. ↑ Kruse, Michael. "The Making of Elizabeth Warren". POLITICO Magazine. Retrieved January 1, 2019. ↑ Randall, Maya Jackson (September 14, 2011). "Warren Kicks Off Senate Campaign". The Wall Street Journal. ↑ Helderman, Rosalind S.; Weiner, Rachel (September 14, 2011). "Consumer advocate Elizabeth Warren launches US Senate campaign with tour of Massachusetts". The Washington Post. ↑ Sargent, Greg (September 21, 2011). "Class warfare, Elizabeth Warren style". The Washington Post. ↑ Benen, Steve (September 21, 2011). "The underlying social contract". Washington Monthly. ↑ Smerconish, Michael (July 30, 2012). "The context behind Obama's 'you didn't build that'". Philadelphia Inquirer. Retrieved August 23, 2012. ↑ Kessler, Glenn (July 23, 2012). "An unoriginal Obama quote, taken out of context". The Fact Checker blog at The Washington Post. Retrieved January 19, 2014. ↑ Rizzuto, Robert (June 2, 2012). "Elizabeth Warren lands party endorsement with record 95 percent support at Massachusetts Democratic Convention". The Republican. Retrieved June 2, 2012. ↑ Bierman, Noah (May 30, 2012). "Deval Patrick endorses Elizabeth Warren for US Senate". The Boston Globe. ↑ "Elizabeth Warren agrees to WBZ-TV debate with Scott Brown". The Boston Globe. June 5, 2012. Archived from the original on June 7, 2012. Retrieved June 9, 2012. ↑ Bierman, Noah (August 15, 2012). "US Chamber calls Elizabeth Warren threat to free enterprise". The Boston Globe. ↑ "Elizabeth Warren: 'The System Is Rigged'". ABC News. Retrieved October 12, 2014. ↑ "Elizabeth Warren: 'Wall Street CEOs' Still 'Strut Around Congress'". Political Capital. Retrieved October 12, 2014. ↑ Kirchgaessner, Stephanie (September 6, 2012). "Warren attacks CEOs who 'wrecked economy'". Financial Times. Archived from the original on September 8, 2012. ↑ Montopoli, Brian (December 12, 2012). "Elizabeth Warren assigned to Senate banking committee". CBS News. ↑ Thys, Fred (January 4, 2013). "Elizabeth Warren Sworn In As First Female Senator From Mass". WBUR. Retrieved May 18, 2013. ↑ Lynch, S. N. (February 19, 2013). "Senator Warren's rebuke of regulators goes viral". Reuters. Retrieved March 10, 2013. ↑ Stephen Webster (March 7, 2013). "Warren: Drug possession warrants jail time but laundering cartel money doesn't?". The Raw Story. Retrieved May 18, 2013. ↑ Erika Eichelberger (May 14, 2013). "Elizabeth Warren to Obama Administration: Take the Banks to Court, Already!". Mother Jones. Retrieved May 18, 2013. ↑ Webley, K. (May 10, 2013). "Elizabeth Warren: Students Should Get the Same Rate as the Bankers". Time. Retrieved May 11, 2013. ↑ Bernie Sanders (May 17, 2013). "Student Loans". United States Senate. Retrieved May 18, 2013. ↑ Drum, Kevin (November 13, 2014). "Elizabeth Warren Gets a Promotion – Or Does She?". Mother Jones. Retrieved December 4, 2014. ↑ Terkel, Amanda; Grim, Ryan (November 13, 2014). "Elizabeth Warren Gets Senate Democratic Leadership Spot". The Huffington Post. Retrieved December 4, 2014. ↑ Miller, S.A. (November 13, 2014). "New chief: Senate Democrats Anoint Elizabeth Warren to Leadership Post". The Washington Times. Retrieved December 4, 2014. ↑ Berman, Russell (November 13, 2014). "Elevating Elizabeth Warren". The Atlantic. Retrieved December 4, 2014. ↑ "Senators Warren, McCain, Cantwell and King Introduce 21st Century Glass- Steagall Act". Elizabeth Warren U.S. Senator for Massachusetts official website. July 7, 2015. Retrieved July 27, 2015. ↑ "Wells Fargo boss urged to resign over accounts scandal". BBC News. September 20, 2016. Retrieved September 20, 2016. ↑ Bryan, Bob (September 20, 2016). "Wells Fargo's CEO just got grilled by the Senate". Business Insider. Retrieved September 20, 2016. ↑ McGrane, Victoria (December 14, 2016). "Warren raises foreign policy profile with Armed Services assignment". 1 2 3 "The Coretta Scott King Letter Elizabeth Warren was Trying to Read". CNN. February 8, 2017. Retrieved February 10, 2017. ↑ Kane, Paul; O'Keefe, Ed (February 8, 2017). "Republicans vote to rebuke Elizabeth Warren, saying she impugned Sessions's character". The Washington Post. Retrieved February 8, 2017. 1 2 3 Seung Min Kim (February 8, 2017). "Senate votes to shut up Elizabeth Warren". Politico. Retrieved February 8, 2017. ↑ Reilly, Katie (March 1, 2018). "Why 'Nevertheless, She Persisted' Is the Theme for This Year's Women's History Month". Time. Retrieved January 22, 2019. ↑ Sweet, Ken (October 3, 2017). "Wells Fargo CEO faces angry Warren, Congress". The Boston Globe. Associated Press. Retrieved October 3, 2017. 1 2 "Who's left? The top 20 US progressives". New Statesman. January 11, 2012. Retrieved October 12, 2014. ↑ "All Information (Except Text) for S.65 – Presidential Conflicts of Interest Act of 2017". United States Congress (official website). January 9, 2017. Retrieved January 10, 2017. ↑ Worley, Will (December 16, 2016). "Donald Trump faces impeachment if new conflicts of interest bill passed". ↑ Rodrigo, Chris. "Elizabeth Warren slams Trump trade deal as just 'NAFTA 2.0'". The Hill. Retrieved December 3, 2018. ↑ Emmons, Alex (August 14, 2018). "Elizabeth Warren Demands in Letter That U.S. Military Explain Its Role in Yemen Bombings". The Intercept. Retrieved February 12, 2019. ↑ Warren, Elizabeth; Khanna, Ro (October 8, 2018). "End US complicity in Yemen's humanitarian disaster". CNN. Retrieved February 19, 2019. ↑ Wise, Justin (January 3, 2019). "Warren on Syria troop pullout: Foreign policy shouldn't be conducted on Twitter". The Hill. Retrieved February 19, 2019. ↑ McGrane, Victoria; Viser, Matt (January 6, 2017). "Warren announces she's running for re-election". The Boston Globe. Retrieved January 6, 2017. ↑ Scheiber, Noam (November 10, 2013). "Elizabeth Warren is Hillary Clinton's Nightmare". The New Republic. Retrieved August 9, 2014. Blake, Aaron. "Why Elizabeth Warren is perfectly positioned for 2016 (if she wanted to run)". The Washington Post. Retrieved August 9, 2014. Kim, Eun Kyung (March 31, 2015). "Elizabeth Warren on 2016: 'I'm not going to run' — and Hillary Clinton deserves 'a chance to decide'". Today. Retrieved April 4, 2015. Grier, Peter (December 15, 2014). "Is Elizabeth Warren really truly not running for president? (+video)". Christian Science Monitor. Retrieved April 19, 2017 – via Christian Science Monitor. "Why Isn't Elizabeth Warren Running for President?". The New Yorker. December 15, 2014. Retrieved April 19, 2017. ↑ Alexandra Jaffe (October 30, 2013). "Run, Hillary, run, say Senate's Dem women". The Hill. Retrieved April 4, 2015. Lowery, Wesley (April 27, 2014). "Elizabeth Warren: I hope Hillary Clinton runs for president". The Washington Post. Retrieved April 4, 2015. ↑ Mimms, Sarah (April 26, 2016). "Sanders and Clinton Campaigns Both Name Drop Elizabeth Warren for Veep". Vice News. Retrieved May 26, 2016. Milbank, Dana (March 4, 2016). "Clinton must make Elizabeth Warren her vice president". The Washington Post. Retrieved May 26, 2016. Garofalo, Pat (May 18, 2016). "The Case Against VP Warren". U.S. News & World Report. Retrieved May 26, 2016. 1 2 Linskey, Annie; McGrane, Victoria (June 9, 2016). "Elizabeth Warren endorses Clinton". The Boston Globe. Retrieved June 10, 2016. ↑ Smith, Rob (July 8, 2016). "Hillary Clinton narrows VP list to 5 people". AOL. Retrieved July 8, 2016. Zeleny, Jeff; Merica, Dan (July 7, 2016). "Clinton narrowing VP choice, waiting for Trump". CNN. Retrieved July 8, 2016. ↑ Sargent, Greg (May 25, 2016). "Elizabeth Warren just absolutely shredded Donald Trump. There's a lot more like this to come". The Washington Post. Retrieved May 26, 2016. ↑ Mimms, Sarah (March 21, 2016). "Elizabeth Warren Slams 'Loser' Donald Trump in Twitter Tirade". Vice. Retrieved May 26, 2016. ↑ Wright, David (May 25, 2016). "Warren blasts Trump; he calls her 'Pocahontas'". CNN. Retrieved May 26, 2016. ↑ DeBonis, Mike (September 29, 2018). "Sen. Elizabeth Warren says she will take 'hard look' at presidential run". The Washington Post. Retrieved December 31, 2018. ↑ Herndon, Astead W.; Burns, Alexander (December 31, 2018). "Elizabeth Warren Announces She Is Running for President in 2020". The New York Times. Retrieved December 31, 2018. ↑ Tennant, Paul (February 4, 2019). "Off and running: Warren launches presidential bid in Lawrence". newburyportnews.com. Retrieved February 11, 2019. ↑ Politi, Daniel. "Elizabeth Warren Launches Presidential Campaign: 'Our Fight is For Big, Structural Change'". Slate. Retrieved February 10, 2019. ↑ "Four Washington State electors stray from Hillary Clinton vote". Seattle, Washington: KIRO-TV. December 19, 2016. Archived from the original on November 17, 2017. Retrieved February 8, 2017. ↑ Galvin, William Francis (November 6, 2018). "Return of Votes for Massachusetts State Election" (PDF). Governor and Council. Retrieved January 5, 2018. ↑ Real Time With Bill Maher. January 27, 2017. Retrieved October 16, 2018. ↑ "Elizabeth Warren on Charlie Rose". May 11, 2009. Archived from the original on October 24, 2012. "Elizabeth Warren on Charlie Rose". March 4, 2010. Archived from the original on September 10, 2012. ↑ "Watch Makers Season 2 Episode 6: Women in Politics". TV Guide. Retrieved May 14, 2017. ↑ "PBS Announces Six New MAKERS Documentaries to Air June through September 2014". PBS. Retrieved May 14, 2017. ↑ "Senator Elizabeth Warren targeted by 'Saturday Night Live'". The Boston Globe. February 12, 2017. Retrieved March 8, 2017. ↑ "Inside the Elizabeth Warren merchandising empire". Politico. August 13, 2017. Retrieved August 13, 2017. ↑ Guerra, Cristela (June 5, 2017). "Will Elizabeth Warren get an action figure?". The Boston Globe. Retrieved June 6, 2017. ↑ "She Persisted". YouTube. February 8, 2017. Retrieved September 16, 2017. ↑ "Where Are You Elizabeth Warren?". YouTube. February 29, 2016. Retrieved September 16, 2017. ↑ "Women's Bar Association Announces Opening of Nominations for Lelia J. Robinson Awards". Women's Bar Association of Massachusetts. March 14, 2011. Archived from the original on June 5, 2010. ↑ Marshall, Josh (April 30, 2009). "Elizabeth Warren". Time. Retrieved June 3, 2009. Bair, Sheila (April 29, 2010). "Elizabeth Warren". Time. Retrieved June 4, 2010. ↑ "The 2010 Time 100". Time. ISSN 0040-781X. Retrieved December 31, 2018. ↑ "These Are The 100 Most Influential People In The World". Time. Retrieved December 31, 2018. ↑ "The Decade's Most Influential Lawyers". The National Law Journal. Retrieved December 4, 2018. ↑ "Featured Profile: Elizabeth Warren". Connecticut Public Broadcasting Network. 2010. Archived from the original on March 31, 2012. Retrieved October 26, 2011. ↑ Brown, David (March 29, 2010). "The Decade's Most Influential Lawyers: Forty attorneys who have defined the decade in a dozen key legal areas". The Recorder. Originally published in The National Law Journal. ↑ "Elizabeth Warren Bio" (PDF). Oklahoma Hall of Fame. 2011. Retrieved November 16, 2012. ↑ "Elizabeth Warren Wins Sacks–Freund Award for Teaching". 2009. Archived from the original on June 4, 2011. Retrieved May 2, 2012. ↑ Capizzi, Carla (May 10, 2011). "Legal Scholar Elizabeth Warren, Historian Annette Gordon-Reed, Entrepreneur Marc Berson to Address Graduates of Rutgers University, Newark". Rutgers–Newark Newscenter. Archived from the original on June 3, 2013. ↑ Lord, Debbie (February 24, 2018). "National Women's History Month: What is it, when did it begin, who is being honored this year?". KIRO 7. Retrieved January 12, 2019. ↑ Warren, Elizabeth; Amelia Warren Tyagi (2005). All Your Worth: The Ultimate Lifetime Money Plan. Free Press. pp. 1–12. ISBN 978-0-7432-6987-2. ↑ Madrick, Jeff (September 4, 2003). "Necessities, not luxuries, are driving Americans into debt, a new book says". The New York Times. Retrieved June 3, 2009. ↑ Himmelstein, David U.; Warren, Elizabeth; Thorne, Deborah; Woolhandler, Steffie J. (February 8, 2005). "Illness and Injury as Contributors to Bankruptcy". SSRN Electronic Journal. doi:10.2139/ssrn.664565. SSRN 664565. ↑ Warren, Elizabeth (February 9, 2005). "Sick and Broke". The Washington Post. p. A23. ↑ Langer, Gary (March 5, 2009). "Medical Bankruptcies: A Data-Check". ABC News. The Numbers blog. Archived from the original on June 9, 2009. Retrieved June 5, 2009. ↑ "A Fighting Chance By Elizabeth Warren". (book official website). Retrieved January 1, 2019. ↑ Jonas, Michael (April 21, 2014). "Book review: 'A Fighting Chance' by Elizabeth Warren". The Boston Globe. ↑ Wilson, Megan R. (June 4, 2014). "Warren nabs $525,000 book advance". The Hill. Retrieved February 23, 2019. ↑ Italie, Hillel (April 18, 2017). "US Sen. Elizabeth Warren launches book tour". The Seattle Times. Retrieved November 16, 2017. ↑ Krugman, Paul (April 18, 2017). "Elizabeth Warren Lays Out the Reasons Democrats Should Keep Fighting". The New York Times. Retrieved May 4, 2017. Lizza, Ryan (May 4, 2015). "The virtual candidate: Elizabeth Warren isn't running, but she's Hillary Clinton's biggest Democratic threat". Profiles. The New Yorker. 91 (11): 34–45. Retrieved July 1, 2015. Lopez, Linette (July 11, 2013). "Elizabeth Warren Introducing a Bill That Would Be Wall Street's Worst Nightmare". Business Insider. "Elizabeth Warren collected news and commentary". The New York Times.